Come join us for a Rotary Community Sports Day at the Cleveland Showgrounds from 12 - 4 pm for a BBQ lunch and old school sports challenges. Meet the international young leaders, enjoy cultural demonstrations, learn about SWY & Rotary and make some new global friends. Please contact Elwyn 0419806302 or Ishbel 0421971090 to offer your assistance, we need plenty of members to support this event. The Ship for World Youth program (SWY) is a prestigious international young leaders’ program, operated by the Cabinet Office of the Japanese Government. Past RYLArian and recent RYLA Coordinator in District 9630, Tegan Brooks has been selected to represent Australia on this program alongside 11 other young Australian leaders. You will recall her presentation at our Rotary Meeting on 4th December 2018. Tegan is travelled with the Australian delegation to Japan on 15 January 2019, joining 230 delegates from 11 other countries, including Chile, Ecuador, Greece, Solomon Islands, Sweden, Tanzania, Turkey, United Arab Emirates, Vanuatu and Japan, to discuss global issues and participate in multi-cultural activities. The participants will then board the Nippon Maru ship to undertake studies in leadership, cross-cultural communication, project management and youth empowerment. The Nippon Maru has embarked on a 33-day journey from Japan to Palau (Indonesia), then on to two ports in Australia, before returning to Japan via the Solomon Islands. In each of these port visits, the young leaders will undertake institutional visits related to their chosen field of study. For the first time since 2011, the Nippon Maru will port here in Brisbane between 15 and 17 February 2019. Tegan has been involved in RYLA in our District since 2015 and is passionate about Rotary, connecting people and sharing opportunities for our youth. 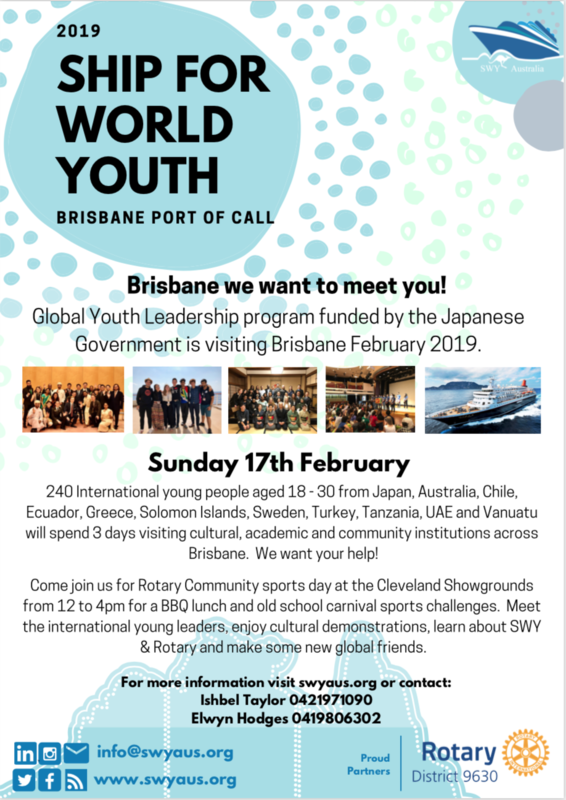 On 17 February 2019, the Ship for World participants will visit Cleveland for an afternoon of sporting fun organised and run by the Rotary Clubs of the Redlands and Wynnum and Manly.